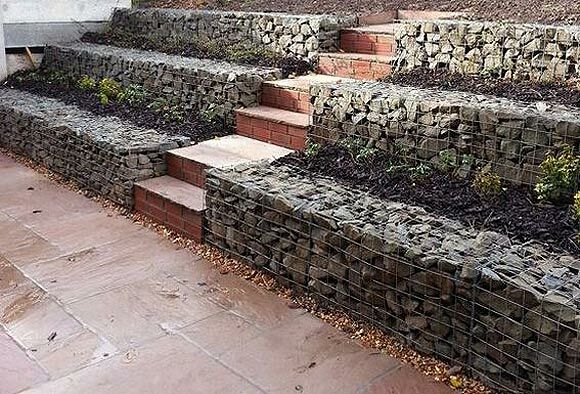 In the past few years I have begun seeing more and more gabions (or “gabion baskets”) at nursery trade shows, landscape supply outlets, and installed in homeowners’ landscapes across the Midwest. Yes, I know they’re nothing new in other parts of the country, and Europe, I’ll get to that. Three years ago when I first saw one in a private landscape in Minnesota, I was prepared to rip the product to shreds, and thought, “Fabulous! There’s my 2012 Worst Product of the Year award.” Because this was the scene: The home sat on a hill above a client’s home, and had been designed by the architect who lived in it (hint, hint). Three LARGE, rectangular gabions – these things were five feet tall by three feet wide – had been purchased and placed end-to-end by the architect on the property line up the hill from my clients, then filled with multi-colored, four-inch stone beach pebbles. The “wall” was about eighteen feet long. These particular gabions were made from thick galvanized wire, which, as I would learn, is popular. I don’t think this gabion terrace system is nearly as attractive as a dry-stacked stone wall. Plus, a true stone wall would afford wider planting beds. It looked ridiculous. It wasn’t retaining anything, just sitting level on the ground, and I honestly assumed that the stone had been delivered in these wire baskets and simply hadn’t been unloaded yet, that the guy was going to be building some massive water garden or something. I asked my client and she said no, a landscaper showed up and stuck the wall there one day, and it was supposed to look like that. I could shoot myself because I didn’t take a picture. 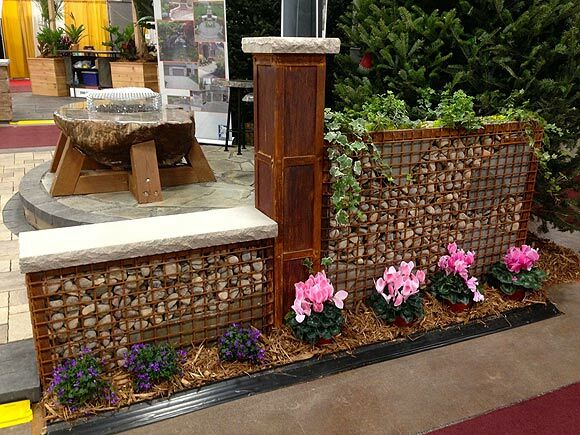 Then I saw this gabion system at a local nursery trade show and thought, OK, I get it. Give me some artistry. I like the use of flagstone inside the cage to add contrast to the beach pebbles. I like the stone cap on the left side, the planting box on the right. And it’s the center pillar that makes it. 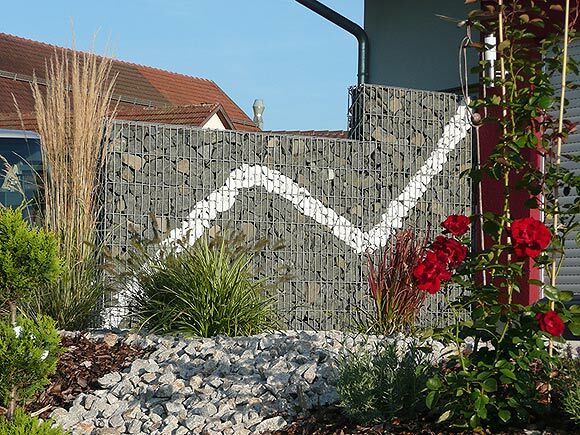 Go online and Google “Gabion basket photos” and you get a hundred photos of gabions from around the world – they’re popular in Europe – ranging from massive gabion installations as highway retaining walls, to entire buildings made from them. Most of them look like bags of rocks, similar to my first experience with the wall on the hill. The obvious reason for their existence is cost; it’s a whole lot quicker and cheaper to create a freestanding or retaining wall of stone by tossing stone in a wire cage than dry stacking wallstone or boulders. I put the photo up of the nice one I saw at the trade show on Facebook and had some interesting responses, one person in particular saying, “The best ones are created with nearly the same meticulous care as a dry stacked wall. We see a lot of them in the southwest.” So it’s another case of trends and products simply taking their time trudging into the consciousness of us rubes in the Midwest. Close as I can tell, they originated in England over the past twenty years. Overall, I like ‘em. But I like the look of the pronounced, rusted, thicker iron cage system than the wire mesh shown in many photos online. 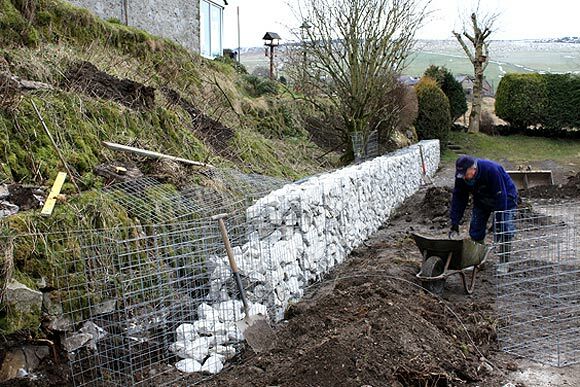 Also required is a bit of artistry in what kind of stone is placed in the gabion, and what you do to create something other than a stone delivery waiting to be unpacked. Now we’re talking. But I can’t help wonder, how long do the wire cages last?